More often than not, I’m groggily making lunch salads for the grown-ups in the house at 7:00 AM. Some of the ingredients, ready for chopping. Here's the mint, ready for chopping. A quick glance at the randomness in the fridge left me with the desire to create a base salad that would work well with the two different pieces of meat I had available — one last small tenderloin of sesame chicken, and a little leftover steak with sauteed mushrooms. I decided that a citronette would work well with both, and pulled out my hearts of romaine and a little pile of citrus fruit, as well as mint, radishes, mushrooms and more. 1/2 small clove of garlic, smashed and minced. I doubled all of the ingredients above, and made two identical salads side by side. My husband’s salad went into a glass pyrex bowl with a lid for easy transport, while mine went into a regular bowl and then right back into the fridge for later. I mixed both batches of citronette in small jars. I started by chopping the veggies and tossing them into their respective bowls. Then, I carefully peeled and sectioned the mandarins, trying not to rip them open. My goal was for their own skins to preserve them in the bowls, so they wouldn’t be leaking liquid onto the greens and wilting them. It worked. I always think citrus fruits are prettier when they’re sliced open, but they travel in salads much, much better when you leave the membranes intact. Mandarin wedges are perfectly bite sized, and are an ideal fruit for salads that will sit in the fridge for a while before being eaten. 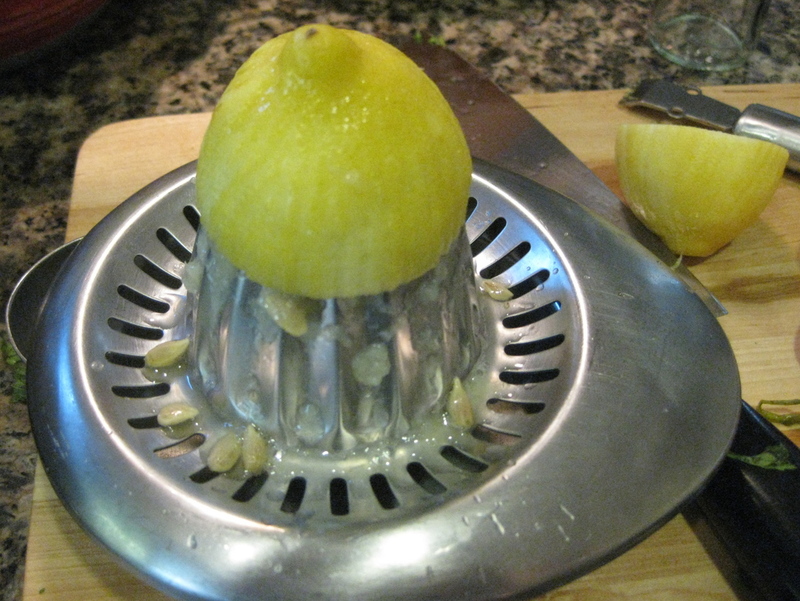 Once I’d constructed the salads, I mixed up the citronette. I snuggled my husband’s dressing jar into the pyrex bowl, while mine joined my salad in the fridge. I used kitchen shears to slice the last piece of sesame chicken over my husband’s salad, and then I slapped the cheery red lid on top. I didn’t bother slicing up the steak for mine — I saved that for right before I tossed it and ate it, about four or five hours later. Here's the chicken version, ready for travel. I can’t tell you exactly what my husband thought of the sesame chicken salad, but he was definitely very grateful. (And I’m quite sure he liked it a lot more than the sesame chicken/red wine vinaigrette combo I tried the other day.) My lunch was absolutely delicious. 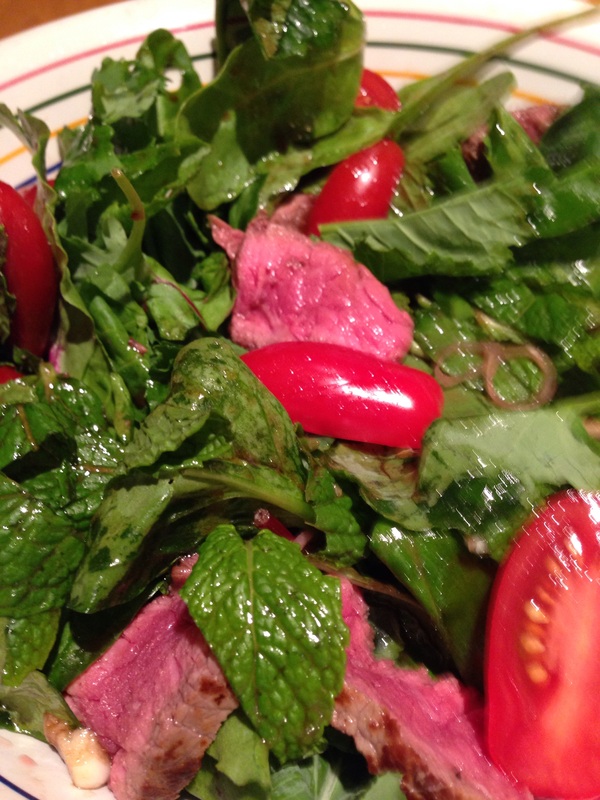 And the steak salad, ready to eat. I really appreciated how different it was from the pear and arugula salad we had last night, with the very same steak and mushrooms. This time, the steak was cold, and sliced directly into the salad. It was a bright, refreshing meal. I also love knowing that all the vitamin C from the fruit and the citronette helped my body make the most of that iron rich steak. I think my favorite bites included steak, mandarin wedges, and mint coated romaine. Crunchy, juicy, sweet, and savory. Exactly how I love my salads. Done — two different leftover meat suggestions. Both worked well, so make your own choice: chicken, or steak?